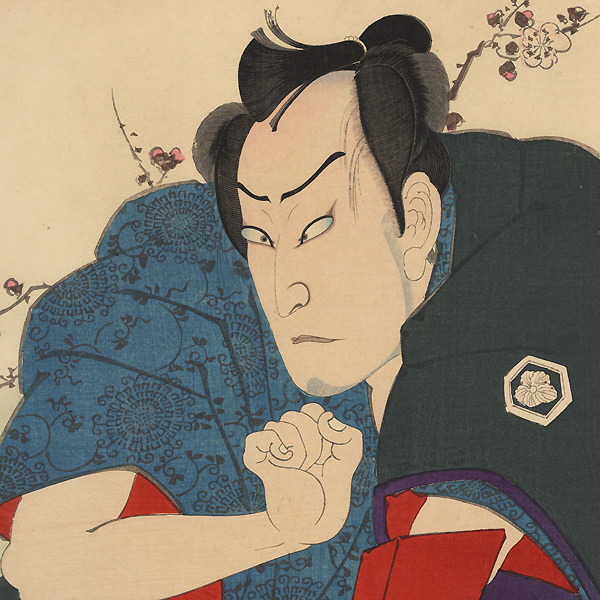 Comments - Handsome kabuki portrait of Ichikawa Sadanji as an angry man, frowning as he looks ahead, his hand clenched into a fist before him. His other hand grips the handle of a red wooden bucket. One sleeve of his outer kimono is pushed down to the waist, revealing a blue kimono with an intricate scrolling pattern. 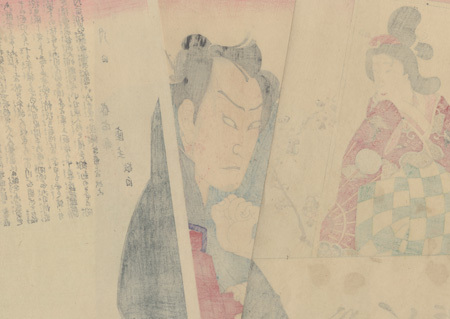 At left, a portrait of a courtesan appears on a simulated wood panel, with what looks like wooden lid with writing on it below. She wears a red print kimono over a pink under robe, tied with a green and yellow checked obi. A few blossoms plum branches are set against a background shaded from red to pink to pale green. Includes embossing on the beauty's white kimono collar. An interesting format with a large expressive figure. Condition - This print with excellent color and detail as shown. Three separate panels. Slight paper remnants on reverse at top corners from previous mounting. Slight toning, a few small marks. Please see photos for details. Good overall.